When it comes to results, the end of the year for a PMC brings with it a time of review. It’s a time to look at how many patients you’ve served, how many lives were impacted, how many ultrasounds were performed, and the list goes on. These results are valuable for the clinic and its supporters to be aware of. Our role in the world of PMC’s provides us with a unique position. Each year we are in more clinics, for extended periods of time, than any other organization. We get to hear, see, and be part of some long-term results. We even see some results that would likely never get connected back to you if it weren’t for divine intervention. Our responsibility is to share these stories with you. Psalm 40:5 Many, Lord my God, are the wonders you have done, the things you planned for us. None can compare with you; were I to speak and tell of your deeds, they would be too many to declare. When we consider the exhaustive list of things to report on and to share the results of, all are worth rejoicing over. While we can report on the obvious, what is the not so obvious? Here are some stories we’ve experienced this year serving you that are examples of results that are not so obvious. At one clinic, a new board member’s mom had considered finding a way out of her 8th pregnancy back in the early 1950’s. She chose to continue with the pregnancy, and he was the result. She had been so blessed by his life, she desired in her heart that he serve in some way for life. Elsewhere, a new trainee shared with us that her sister had experienced 5 abortions. Since her involvement with the clinic, this trainee is now skilled in life affirming coaching and will recognize the root of the pain in her sister’s face when she, as the childless aunt, shares in Christmas morning mayhem with the others around the tree. When I interviewed one patient at a clinic we served, the results we discovered came in the story of the support person that came with her. She came to know Christ as a result of being given a Bible 5 years ago as she struggled with a suboptimal situation involving pregnancy. At one fund raising event this year we even discovered that a grandmother, who raised a little boy into a young man serving his country, was attending the event for a clinic “just like the one her son went to 25 years ago” and that clinic from 25 years ago was one of those we serve. That clinic was one of you. Yes, many Lord are the wonders you have done! Were I to speak of your deeds, they would be too many to count. Instead, I will rejoice in the results I can recall. 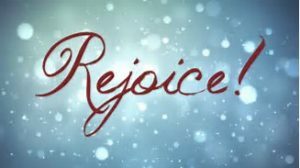 I will rejoice not just at Christmas time, or the end of the year, but daily. Daily I will rejoice in the wondrous things you have done, and I will look expectantly for you to reveal yourself to me. I will live in obedience to you and leave the results in your hands. I will rejoice, knowing you have the results of each dot involved.